This Three Cheese Chicken Casserole has just about everything going for it. It’s not only delish, it’s pretty easy, fairly fast, and even faster if you use leftover chicken. I found this recipe in my little cookbook of family recipes I typed up for my daughter years ago. I seem to turn to these old faves even more during crummy weather! I guess I’m looking for a little comfort and this one delivers! If you’re ever looking for a casserole to take to a family who needs a little pick me up, this is the one. Three Cheese Chicken Casserole makes a pretty good-sized casserole; I like to set a little aside and freeze it for a quick lunch or “emergency” meal later since there’s only three of us at the house. I love cooking once and eating twice, but I don’t love facing a week of leftovers, if you know what I mean!! As far as cost, most of these ingredients can be bought and sale with coupons, if you use them. The cheese is the priciest item, so really watch the specials and chuck it in your freezer for casseroles like this. When bell peppers and/or mushrooms are on sale, but extra to last through the next week, too. And yes, you can use rotisserie chicken, but plain old sales priced chicken, leftover, perhaps, will be even less expensive. Preheat oven to 425 degrees F. Butter or Oil a large casserole dish. In a large skillet, heat the butter over medium high heat until melted. Add vegetables and stir, then cover for several minutes. Uncover and continue cooking until excess liquid has evaporated, the vegetables are softened and the mushrooms slightly browned, stirring as necessary. Place cottage cheese and milk in a blender or food processor and pulse until smooth. In a large bowl, add the cottage cheese mixture, cheeses (except the reserved) the soup, herbs, salt and pepper to taste. Mix together. Add in the pasta and chicken. Place in casserole, cover with cheese, and bake 20 to 25 minutes until warm and bubbly. Prepackaged shredded cheese works well in this, but has a anti clumping agent. Shredding your own makes for the creamiest casserole. As far as the herbs and seasoning, I often add a little more! I just go by taste. This entry was posted in Click here for Bargain Meals, Click here for Fabulous Food Posts and tagged Bell Peppers, Canned Soup, Casserole, cheddar, Cheese, cottage cheese, Freezes Well, Frugal Hausfrau, leftover Chicken, mushrooms, parmesan. Bookmark the permalink. Is this good for one serving? Coz it looks like one to me! 😀 I just had finished a heavy meal, but I feel I need some of this as well! My tummy must have been having too many extra space these days. This is a perfect comfort food, Mollie. I bet this tastes divine with all those cheeses! Thank you for bringing such yummy dish to this week’s FF party. Have a great weekend! 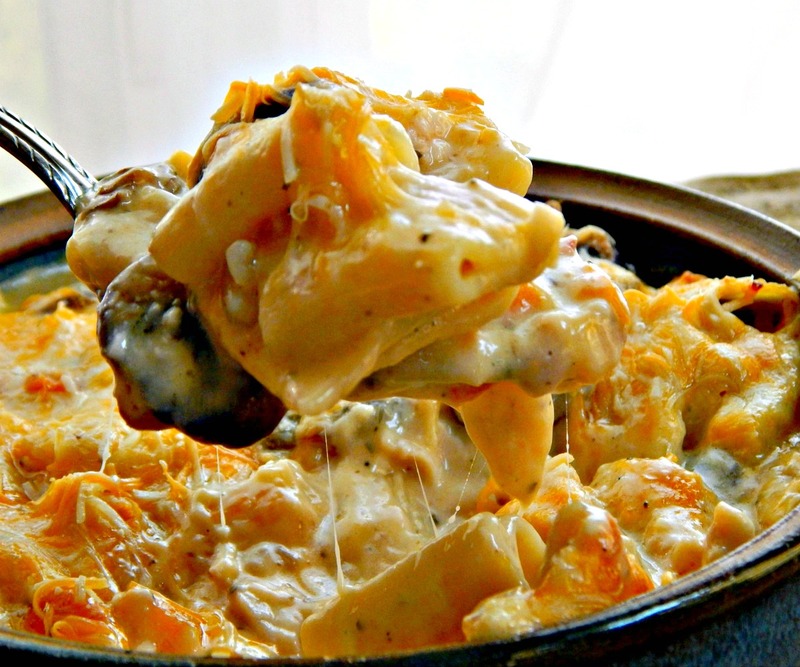 There’s nothing like a big pan of cheesy casserole to chase away the weather blues. We are FINALLY getting some warm weather over here, I was so sick of the wet and cold. I hope it comes your way soon! Looks so good Mollie. Up until this week we had coldish dreary weather now it’s exatly the opposite I haven’t even had time to put my AC units in, we went from one extreme to the next. Right now it’s 88 degree’s in my house, awful, at this point I would gladly have the cool dreary/ Hope you are well, this recipe is wonderful. This recipe was an absolute hit with the folks! We’re seesawing back and forth – last week was shorts, this week I’ve got my jackets out again. Crazy! I’m with you though, I’d rather have cool than too hot. Yummy casserole dish though I’m eating lights soups as I hack and cough my way through day 3 of a miserable throat infection. Oh poor baby – there is nothing worse than being sick in the spring. Here’s hoping to a speedy recovery! Day 4 … productive cough and a lot of nose blowing. I’m in my robe and nightie, drinking hot tea with honey and lemon and baking a tartine SD loaf. 🙂 Other than making bread at home under my mother’s watchful eye as a teenager, I had more experience with sourdough. I started making it when I was about 20. No info on it. Just all word of mouth, lol! Of course, it was up to today’s standards, I’m sure! It seems I don’t know when to wear shorts and when to wear my winter jacket or what kind of weather each day will hold! Tell me about it! We started the day with sunshine, then moved onto torrential rain, and now it’s cold! I just keep thinking Climate change! Definitely comfort food! Hope your weather improves soon.